PA chairman accuses Israel, US and Hamas of conspiring to thwart the establishment of an independent Palestinian state. 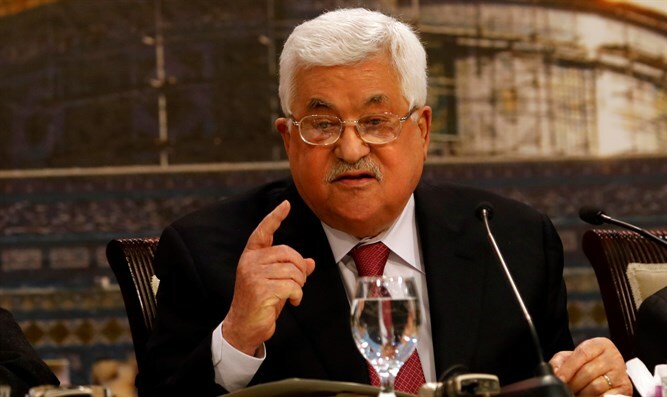 Palestinian Authority (PA) chairman Mahmoud Abbas said on Sunday that the US peace initiative, dubbed “the Deal of the Century”, and the "Hamas plot" to thwart the establishment of a Palestinian state will not work. In a speech in Ramallah marking the anniversary of the death of Palestine Liberation Organization (PLO) and PA founder Yasser Arafat, Abbas said that the Palestinian people will continue to stand firm over their land and will continue to fight until the right to self-determination and the establishment of their independent state are realized. “There is an American plot embodied in the ‘Deal of the Century’, and there is an Israeli plot to carry out the deal, and unfortunately there is another plot by Hamas to thwart the establishment of an independent Palestinian state," claimed the PA chairman. He added that the PLO Central Council recently made decisive resolutions regarding the PLO's relations with all other parties, stressing that the “Deal of the Century” does not fulfill the Palestinians' aspirations and dreams, and that there is no Palestinian who will betray the Palestinian cause or agree to plots against it. The PLO Central Committee, which convened at the end of October, had decided to cancel recognition of Israel until the Jewish state recognized a Palestinian state on the pre-1967 borders with eastern Jerusalem as its capital. The PA, however, has never actually accepted the legitimacy of Israel as a Jewish State, and the PLO charter continues to reject the existence of the State of Israel despite the provision of such recognition in the Oslo Accords. Abbas has rejected US attempts to restart peace talks with Israel and has been boycotting the US ever since President Donald Trump’s recognition of Jerusalem as Israel’s capital last December. The PA chairman and his Fatah faction have also been at odds with Hamas since 2007, when Hamas violently took over Gaza from Fatah in a bloody coup. That deadline was initially put back by 10 days and had later reportedly hit “obstacles”. It has never been implemented and is one of many attempts that have failed over the years to ease the tensions between the two groups.